CAN YOU MAKE DONATION TODAY? 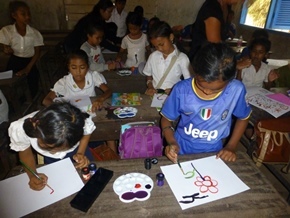 Join the most important effective fundraiser (Genevieve Fenster) making a huge difference for hundreds of children at CHAB in Siem Reap, Cambodia. Don't you know how to raise funds for our school? Click here.. Regular gifts allow us to plan life-saving programs around the Siem Reap, Cambodia, and ensure that we can continue to be there for vulnerable children who need our help the most. It also helps us to be well-prepared and able to respond quickly when an emergency strikes. You'll make sure the most vulnerable children will have a healthy start. You'll help them get an education. You'll be stepping in when they've lost their families to disease during a poverty crisis, or when they need protection from abuse and exploitation. Become a regular giver and save a child’s life today!!! Your Donation is to provide the best solutions for a lot of vulnerable children at CHAB’s school and other children from countryside villages of Siem Reap, Cambodia. Children need your help right now. 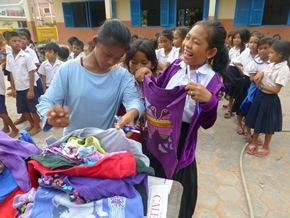 You can make the difference in the lives of children in countryside villages of Siem Reap, Cambodia. Help us those who are most vulnerable. By supporting CHAB, you’ll not only make a difference to a child's life today, you’ll be making the difference to poor children in the countryside villages because we operate in more countryside villages and help more children. Our operation in the countryside villages can reach and help directly to many poor and orphan children in rural villages. We do whatever it takes to reach vulnerable children, from stopping abuses, using children’s labor, lack of nutrition, children’s health issues, and abuse of children’s educational right. We work with authorities, communities, parents and children themselves - to make sure no child is forgotten. Why is online donation important? Online donation by GoFundMe is best solution that allows all kids of supporters use the best service .to help save all vulnerable kids at CHAB school and community. All donors, sponsors, or supports can make donations electronically from any location at any time. Our service is simple and easy for all generous persons around the world which like to support the CHAB Kids Siem Reap project. If you like to donate by online, Click the link of GoFundMe or Donate by CHAB's Account, Click Here. Do something amazing today. Join with us to help children by making a monthly donation.